The ship: a rendering showing what the ship will be like when launched. A superior outside cabin on the new ship. The MS Eurodam is set to be one of the most luxurious ships in the Holland America Line fleet (a division of Carnival Corporation) when it is launched in June 2008. The 2,100 passenger ship (800 crew members) will be the company’s first ‘Signature’ class ship. Eurodam is scheduled to debut in June 2008 with European inaugural events and then cruise the Baltic region through the summer. The ship will then offer its first transatlantic cruise and sail Canada / New England in the autumn, followed by Caribbean itineraries for the remainder of 2008. With an estimated all-in cost of $450m, the new 86,000t Panamax Eurodam will be built at Italian shipbuilder Fincantieri’s Marghera shipyard. The Eurodam will further the evolution of Holland America Line’s sophisticated mid-sized ships. The ship, registered in the Netherlands, will be 935ft long, 105.8ft wide and will be able to make a cruising speed of 23.9kt. In March 2007 the first block of the keel was laid. Holland America have also exercised their option to order another ship from Fincantieri (a sister ship to the Eurodam) which will be launched in 2010 at a cost of over $563m. Staterooms and suites on the new ship will feature an inspired and a distinctly different décor to previous ships in the Holland America fleet of 13 ships. The staterooms and suites will offer a calming, more monochromatic design, accented with bursts of colour and will replace the floral schemes used in the past. The elegantly simple design is enhanced with rich wood tones and the use of burnished nickel fixtures. 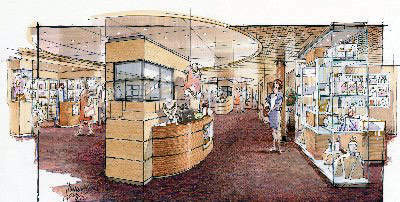 Passenger corridors leading to the guest staterooms will also be decorated in the same contemporary theme. The deluxe veranda suites will feature rich walnut furniture, charcoal grey seating, crisp white draperies and a patterned grey tip sheared carpet – accented with powder blue and citrus orange in strategic areas to add dimension and interest. The stateroom interiors will have light, maple-toned furniture to create a brighter environment, with the recessed area behind the beds painted sky-blue and covered by sheer curtains with a burn-out, wave pattern that allows hints of blue to show – in effect, creating the sense of a window. 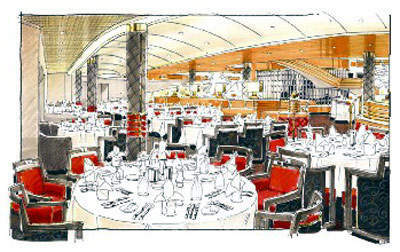 The new décor will be in all staterooms on the 11-passenger deck Eurodam. For the first time on any Holland America ship, staterooms will be added to the top decks. Deck 11, just off the Crow’s Nest, will feature 10 veranda staterooms and, just below on Deck 10, 28 staterooms with verandas and four, forward-facing ‘panorama’ rooms will be located. Staterooms will feature all the Signature of Excellence premium amenities: plush Euro-top Mariner’s Dream beds, deluxe waffle/terry cloth robes, Egyptian cotton towels, flat panel televisions, DVD players, make-up mirrors with halo lighting, massage shower heads, professional grade hair dryers, fresh flowers and complimentary fruit baskets. With one more deck than Holland America’s 10-deck Vista-class ships, the Signature-class Eurodam will feature three alternative dining venues, including a new pan-Asian restaurant on Deck 10. New innovations include a 50-seat lounge surrounded by panoramic views overlooking the ocean expanse and the Lido pool. Other additions are an Explorer’s Lounge Bar, a new specialty restaurant adjacent to the Lido offering the finest in Italian food, elegant luxury jewellery boutiques, new atrium bar area, enhanced show lounge with theatre-style seating, and a photographic and imaging centre. The Explorations Café, powered by The New York Times, will be located on the starboard side of the Crow’s Nest, providing a scenic backdrop for guests wishing to enjoy specialty coffees, surf the internet and take advantage of the café’s music listening stations. Dining options for passengers will include The Pinnacle Grill (formal reservation required), The Main Dining Room (formal), Lido Restaurant, Terrace Grill, and Explorations Café. 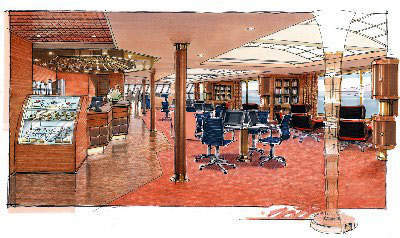 With the additional deck, the Eurodam will have 63 staterooms more than the latest Vista-class ship. Forty-seven will be veranda staterooms and ten will be a new style of stateroom with ceiling-to-floor and wall-to-wall panoramic windows. 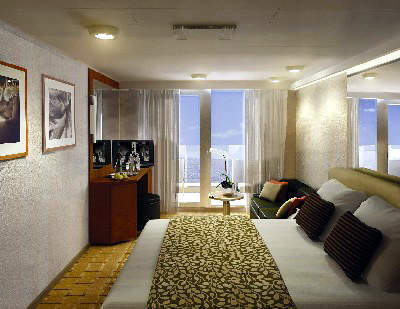 In total, the Eurodam will carry 1,022 staterooms, 86% with outside staterooms, 67% with verandas. The ship will continue several much-admired Holland America Line features, including outside-view glass elevators at midship; the Pinnacle Grill and Pinnacle Bar; the innovative Culinary Arts Center presented by Food & Wine Magazine, where culinary experts provide cooking demonstrations and intimate classes in state-of-the-art onboard show kitchens; an expanded Greenhouse Spa and Salon with thermal suites and hydro-pool, the largest gymnasium ever built for Holland America Line; and a youth facility that includes the teens-only Loft. The Eurodam will feature the latest state-of-the-art navigation and safety systems including dynamic positioning abilities to hold the ship in a precise position. The vessel will be powered by six diesel generators and propelled by the latest Azipod propulsion technology.